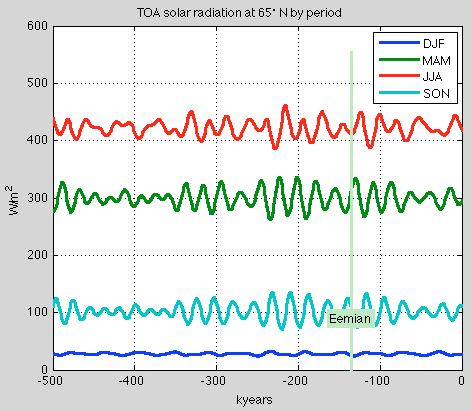 In Part Four we started looking at the changes in solar insolation due to the different orbital effects. 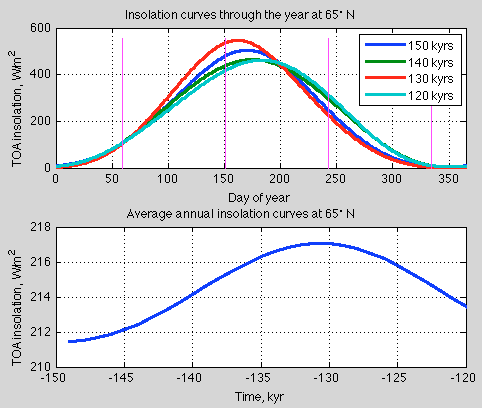 Eccentricity itself has a negligible effect on solar insolation. 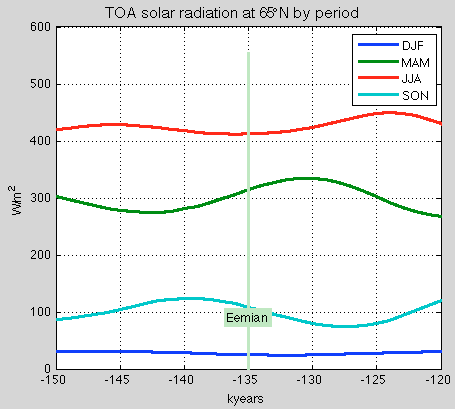 Obliquity and precession change the (geographic and temporal) distribution of solar radiation, but not the annual amount. There is less variation by year than the value on any given day (compare fig 5 & 6) in Part Four. 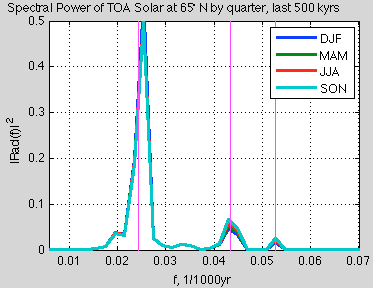 Of course, higher solar radiation in one part of the year due to tilt, or obliquity, means less solar radiation in the “opposite” part of the year. 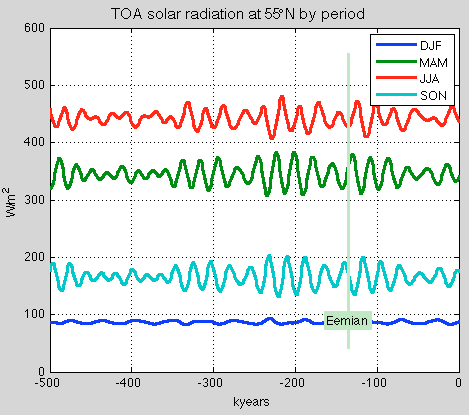 In the graphs above we see that at the peak of the Eemian inter-glacial, JJA (June-July-August) radiation is a minimum, MAM (March-April-May) is on the upswing towards its peak, SON is on a downswing past its peak and of course, DJF is very low and not changing much because there isn’t much sun at high latitudes during the winter. 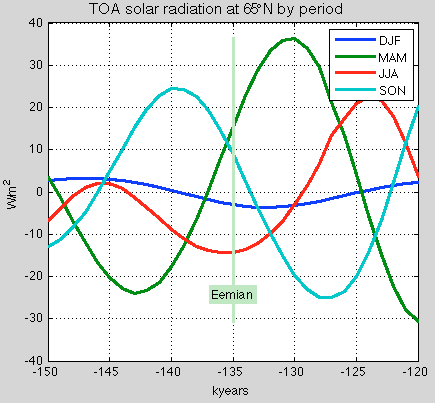 As we would expect, the peaks and troughs occur at the same times for 55ºN and 65ºN. What is different between the two latitudes is the change in annual insolation with time at a given latitude. 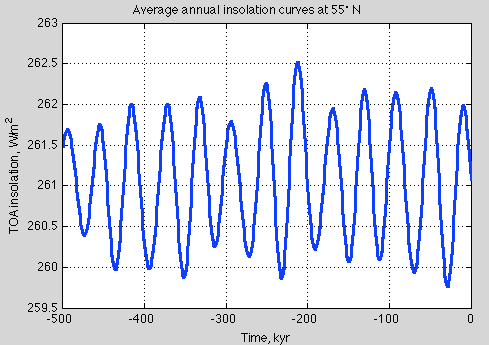 The 65ºN insolation varies by 7 W/m² over the last 500 kyrs, while the 55ºN figure is not quite 3 W/m². By comparison 45ºN varies by less than 1 W/m². Now by comparison, due to increases in atmospheric CO2 and other “greenhouse” gases, the “radiative forcing” prior to any feedbacks (i.e., all other things remaining the same) is about 1.7 W/m² over 130 years, or 1.3 W/m² per century. Now this has been applied globally of course, but in any case recent changes have been 30 – 50 times the rate of increase of high latitude radiative change during one of the key transitions in our past climate. These values and comparisons aren’t aimed at promoting or attacking any theory, they are just intended to get some understanding of the values in question. We have quite large changes (comparatively) in each season. For example, the March-April-May figure increases by 60 W/m² from 143 kyrs ago to 130 kyrs ago, which is almost 0.5 W/m² per century, on a par with recent radiative forcing changes due to GHGs. 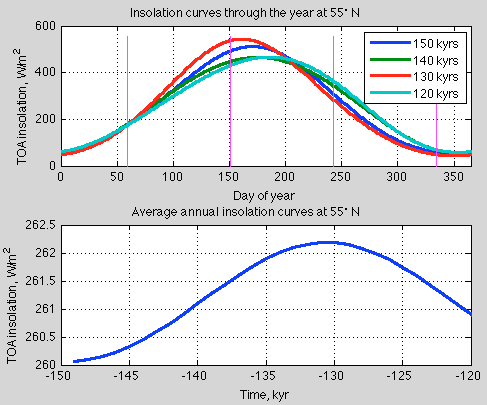 The problem with just looking at MAM – and is the reason why I started plotting all these results – is if the increase in MAM insolation caused more rapid ice melt at the end of winter, then didn’t the similarly large reduction in SON (autumn) insolation cause more ice to be there ready for spring? Each year has all the seasons so the whole year has to be considered..
And if there is such a clear argument for one season being some kind of dominant force compared with another season (some strong non-linearity), why isn’t there a consensus on what it is (along with some evidence)? Taking these two [Milankovitch and chaos] perspectives together, there are currently more than 30 different models of the seven late Pleistocene glacial cycles. In some later articles we will look at the spectral characteristics of the ice age record so knowing the spectral characteristics of orbital effects on insolation is important. All graphs produced thanks to the Matlab code supplied by Jonathan Levine. SoD, there are green lines marked with Eemian at -135kyrs. But this is approximately the start of the warming, still deep in the glacial. The Eemian was rather from -130kyrs to -120 kyrs, I think. Dating these events has some uncertainty. Broecker’s 1992 Nature paper – Upset for Milankovitch Theory – noted that, based on 234U-230Th dates from Devil’s Hole in Nevada, the previous inter-glacial termination began at 145,000 years. This contrasts with earlier dates given of around 128,000 years. The geochemist in me says that the Devils Hole chronology is the best we have. And the paleoclimatologist in my says that the correlation between the accepted marine chronology and Milankovitch cycles is just too convincing to be put aside. 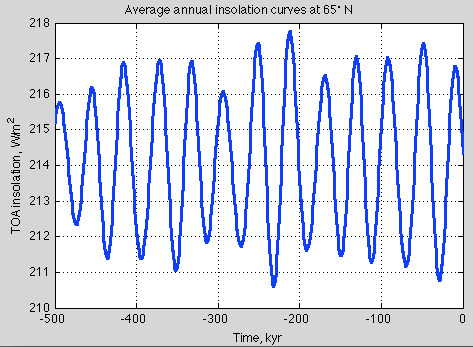 I will be digging deeper into the dating of ice ages in future articles because it is a big subject, and much of the explicit dating methodology (and probably now dating bias) was tied to Milankovitch cycles. I’m currently reading a lot of papers from the EPICA project, mostly from 2008 onwards. SOD: I’m not sure what the word “termination” really means when applied to an ice age. It could be the first DATE at which ice volume began to markedly decrease or it could be the PERIOD of most rapid melting (constant steepest slope). These changes in ice volume presumably lag behind changes in temperature, and we measure both by a variety of proxies. Recent history includes the Last Glacial Maximum, “termination”, and the Holocene, with the possibility that there are periods between or that aren’t given names or possibly periods of overlap. The Holocene officially began 11,700 years BP, which is well before the end of the period of rapid sea level rise ended about 8,000 ybp. Wikipedia says the LGM was between 26,500 and 19,000–20,000. A brief search didn’t uncover a date or range of dates for “termination” or a definition. SoD, 145kyrs seems outside the estimates I know. a. Interglacials are initiated by precessional Milankovitch cycles. b. Regional insolation increase in the NH is the primary forcing. c. Milankovitch forcing is enhanced by albedo feedbacks, not CO2. d. For insolation to have an effect on ice sheets, their albedo must be lowered. e. This is achieved via the dust-storms that precede every Interglacial. f. The dust-storms are caused by CO2 reaching critically low levels. g. The lack of CO2 causes global plant die-back and barren lands. h. Dust from these barren lands is blown across the ice for 10,000 years. i. And now we have all the elements in place to produce an Interglacial. You need to read the complete series. The evidence that precessional Milankovitch cycles have initiated the recent interglacials is actually quite weak. It’s also probably not necessary to invoke CO2 for a reduction in plant cover. A decrease in global precipitation caused by lower specific humidity at the lower global temperature is probably sufficient to explain desertification leading to higher atmospheric dust levels.